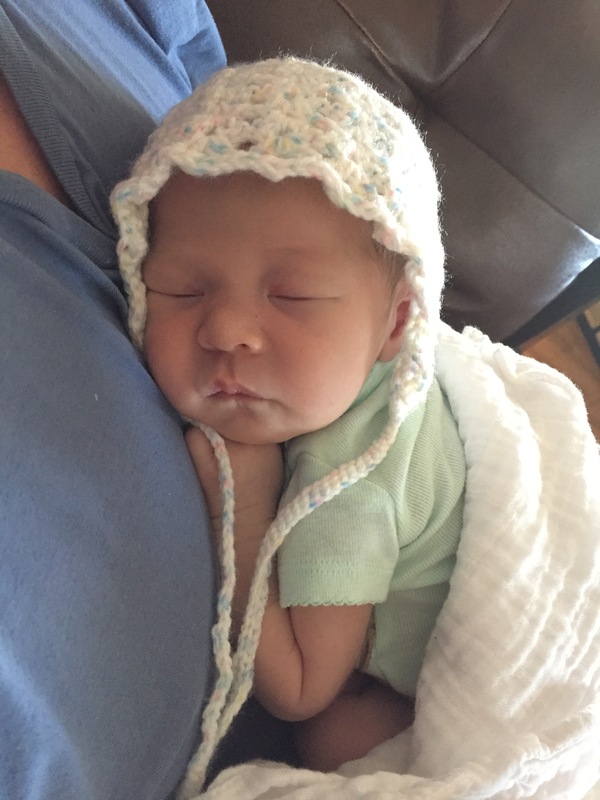 Who knew that having a newborn infant would keep one from writing blog posts or crochet patterns? (cheeky smile). 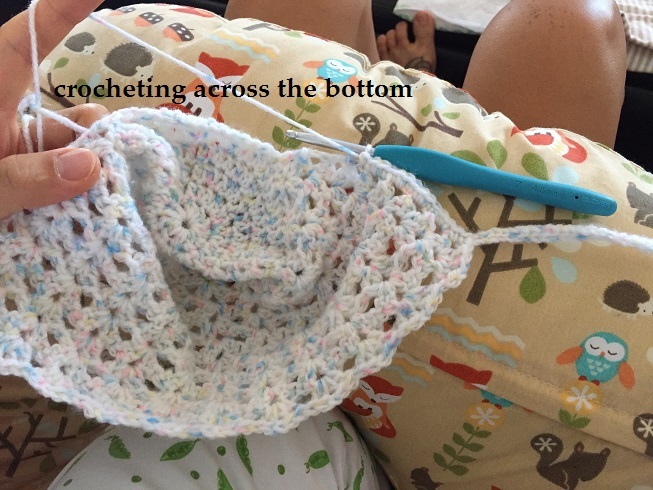 I’ve been working on this pattern in very baby increments (bada-psh). I made it to use as a prop for Juno’s newborn photos, which we had done when she was 10 days old. 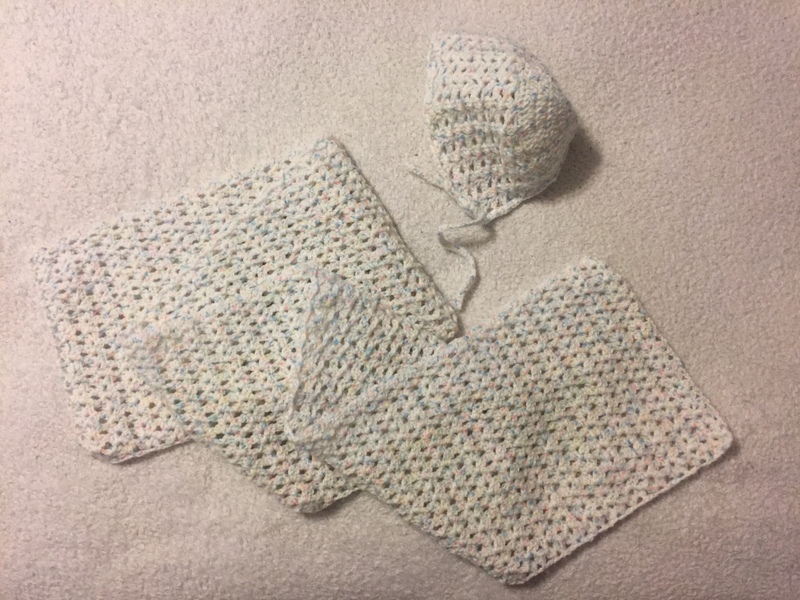 Both the bonnet and shawl are constructed from a simple fan stitch, and it works up fairly easily. The shawl measures 49 in. by 8 in. and the bonnet measures 5.5 in. by 5 in. when laying flat on its side. 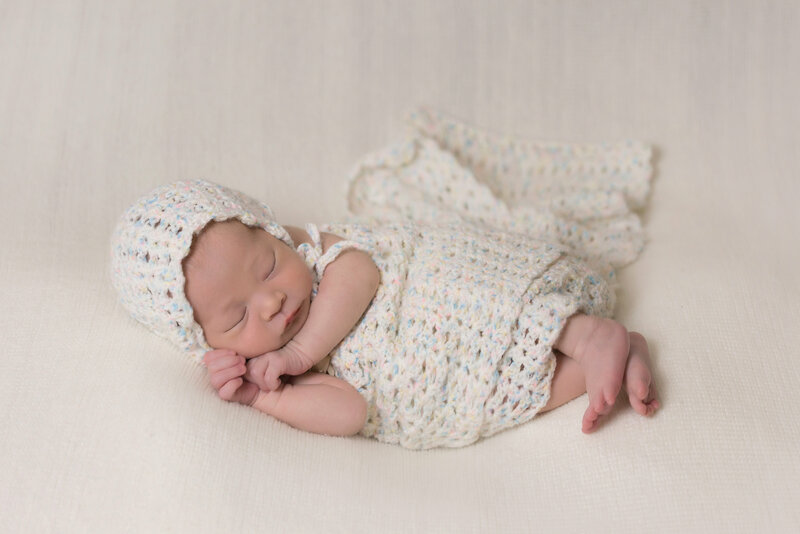 *I haven’t tested the pattern or made a gauge swatch on account of limited time with new baby, so crochet this pattern at your own discretion! 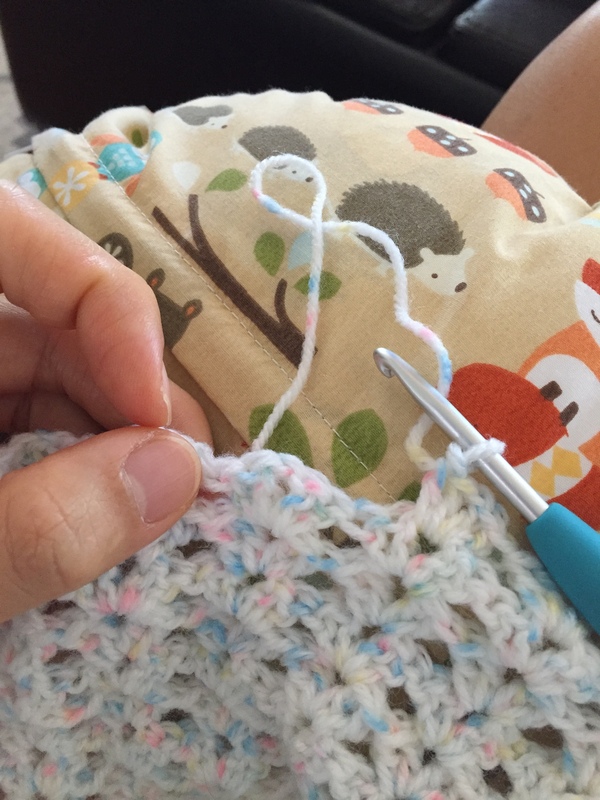 (FYI, I tend to crochet tightly.) If you do notice any issues with the pattern or have questions though, please let me know! Row 1: Ch 141, (2 dc, ch 1, 2dc) into the 5th ch from the hook, *sk 3 st then (2dc, ch 1, 2dc) into the next st.* Repeat until the last two ch. Sk 1 ch and dc into the last ch. Ch 3. Turn. Row 2: Sk the first 3 dc. (2dc, ch 1, 2dc) into the ch 1 sp. *sk 2 dc, (2dc, ch 1, 2dc) into the next ch 1 sp. * Repeat to the end. Dc into the top of the turning ch. Ch 3. Turn. At the end, fasten off and weave in loose ends of yarn. Round 1: Ch 3 and sl st into the first st to form a ring. Ch 3 (counts as first dc hereon out) then dc 11 times into the center of the ring and sl st to top of the ch 3 to join the round (12). Rnd 2: Ch 3, dc into the same st, *2dc in next st* repeat around then sl st to the top of the ch 3 to join (24). Rnd 3: Ch 3, 2dc in next st, *dc, 2dc in next st* repeat around then sl st to the top of the ch 3 to join (36). Rnd 4: Ch 3, dc in next st, 2dc in next, *dc 2, 2dc in next st* repeat around then sl st to the top of the ch 3 to join (48). Rnd 5: Ch3, dc in next 2 st, 2dc in next, *dc 3, 2dc in next st* repeat around then sl st to the top of the ch 3 to join (60). Row 1: Ch 3, *sk 1, [2dc, ch 1, 2dc] all in the next st* repeat 10 more times. At the end, sk 1 st then dc in the last st. Ch 3, then turn (11 fans total). Rows 2-9: Ch 3, *sk 2 dc, [2dc, ch 1, 2dc] all in the ch 1 sp* repeat to the end, then dc in the top of the ch 3. Ch 3, then turn (11 fans total). The tassels and the bottom of the bonnet: Ch 41, turn, then sl st 40 back up for one tassel. Sc 66 across the bottom of the bonnet. Ch 41, turn, then sl st 40 back up for the other tassel. 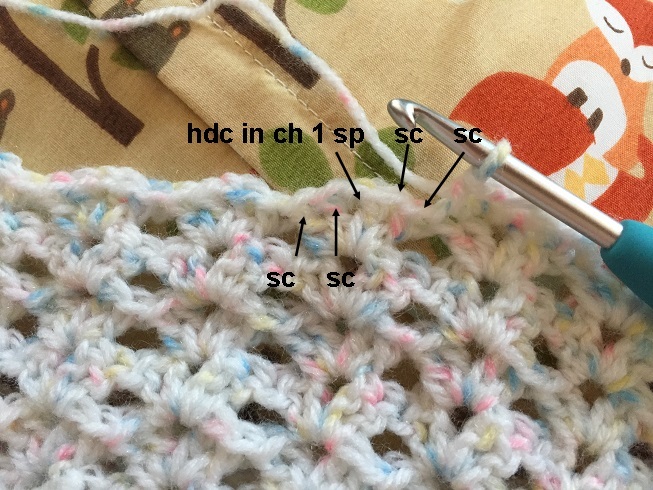 To finish the top edge of the bonnet: Sc into the 2dc, hdc into the ch1 sp, *sc into the next 4 dc, hdc into the ch 1 space* repeat to the end. Fasten off then weave in the ends.